I feel a little late to the party in discovering this one, but have you heard of the magazine Pink? It's the only business publication for women. 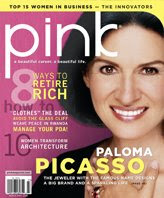 Pink has a super site that has an interview with the co-founder and CEO of the magazine, Cynthia Good. She talks about the challenges they initially faced in getting the new magazine published, and being turned down, and yet they personally thought they were onto something. Two years later the magazine has a circulation of close to half a million, and have done articles on top celebrities who are in business. It's definitely a site worth checking out, and subscribing to the magazine.